THE FOREST FOR THE TREES is an intimate look at an unlikely team of young activists and old civil rights workers who come together to battle the U.S. government. Filmmaker Bernadine Mellis is the daughter of 68-year-old civil rights lawyer Dennis Cunningham. Dennis started out his career representing the Black Panthers and the Weathermen. Judi Bari was an Earth First! leader who was one of the first to place as much importance on timber workers' lives and families as she did on the legacy and future of the trees. But that strategic relationship was too much of a threat. Her car was bombed in 1990, and three hours later, she was arrested as a terrorist--charges that were later dropped. Convinced it was a ploy by the FBI to discredit her and Earth First!, Judi decided to sue. Cunningham took on Judi's case and after 12 years, Judi Bari v. the FBI finally gets a court date. Knowing this is one of her father's most important cases, Mellis is there at strategy meetings, at breakfast, driving to and from the court, documenting her morally driven, very tired dad. Not your typical "Take your daughter to work day," THE FOREST FOR THE TREES offers access into a unique father-daughter relationship, the painfully short yet extraordinary life of Judi Bari, and a piece of U.S. history that everyday grows increasingly resonant as once again the lines between dissent and terrorism are being intentionally blurred. Note: This is a completely reworked version of the award-winning 2004 film of the same name. See the filmmaker's note below. "I completed a version of THE FOREST FOR THE TREES as my master's thesis from Temple University in 2004. While that film was the same length as the final cut, and essentially followed the same story, it was quite a different film. It was my first documentary, and I was producer, director, shooter and editor, learning everything about the process as I did it. I submitted the film to festivals, and it showed at several (as listed here). Soon after finishing it, in early 2005, I went to the Working Films/MASS MoCA Documentary Residency, designed to help filmmakers develop outreach strategies for social justice films. There, I was encouraged to re-open the film by Judith Helfand (BLUE VINYL), who later became one of the Executive Producers of THE FOREST, along with Julia Parker Benello. Judith felt that if I brought in an editor, I could bring the film to a new level. Then, in the summer of 2005, Chicken & Egg Pictures was founded by Judith Helfand, Julia Parker Benello, and Wendy Ettinger in order to support emerging and veteran women filmmakers. Chicken & Egg provided the support to hire an editor, Susan Korda. Working closely with Judith, Susan and I spent several months re-editing the film. 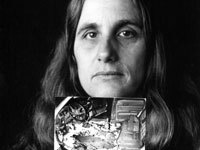 The old cut was divided into two parts: The first half was about Judi Bari, her organizing work in the Redwoods, the bombing of her car, and the FBI and Oakland Police's arrest of her and Darryl Cherney. The second half followed Judi's civil case against the FBI, and the legal team who fought that battle, which included my father, Dennis Cunningham, as lead attorney. What Judith Helfand pushed me to do was to integrate those two stories, and to foreground my father's role a bit more, teasing out some of the richness of the father-daughter element of the film. "[I was] enormously moved. It is a powerful and eloquent document, beautifully done. It brings Judi Bari and the movement to life, and does a superb job on the trial itself...[Dennis Cunningham's] final statement to the jury was a model for such a thing -- warm, human, simple, persuasive. The film itself is so inspiring I hope it will be seen widely." "An engaging and highly personal tale... Bernadine Mellis tells Bari's story with what is clearly admiration. We see a brave woman whose dedication to the lives of trees inspired even loggers! The film's focus on Bari's court case brings together the often separate worlds of politics and environmental science... [The Forest for the Trees] will serve as a starting point for discussions on how difficult it is to turn environmental awareness into political change. The film is full of information but also raises many questions, it is factual but it also moved me to tears, it made me angry but in the end left me inspired.... a powerful film about a powerful woman, her dedication to the environment, and her allegiance with dedicated lawyers who protected her rights. I will use this film in my science class and pass it on to my political science colleagues. It needs to get out there." "At the heart of the film is Bari herself, a true folk hero with an electrifying on-screen presence." "As the story unfolds to its dramatic ending, this film provides unparalleled insight into threats to civil rights in the context of environmental issues." "[The Forest for the Trees] does a great job of portraying Judi's strength and conviction... I would highly recommend this film to anyone who cares about justice, the FBI's misdeeds, redwood forests, Earth First! and/or Judi Bari herself." "The Forest for the Trees is wonderfully done: well-paced, thought-provoking and moving. It is a love letter to Bari and to Cunningham and a testament to perseverance and fighting the good fight." "Shines a worthy light on the folks whose street-level legal legwork helps to preserve civil and human rights... Mellis' access to behind-the-scenes legal strategizing is fascinating, and her ode to her principled, passionate parent is well-deserved." "Oral history at its finest... The Forest for the Trees captures the lawyer and his team with their guard down, allowing a look behind the brave fronts that the men present to the press and the courtroom... Haunting footage of Bari's speeches and interviews prior to her death are interwoven to great effect, and imbue the tale with a sense of urgency and poignancy. Forest for the Trees is the gem of the Northwest Film Center's Human Rights on Film series." "As current as today's headlines... Classes in social sciences can utilize [The Forest for the Trees] as a case study for further examination of individual rights..."
"Recommended... Ms. Mellis presents a well-balanced piece showing both the side of the activists as well as the logging industry... College and university libraries with programs in environmental studies, human rights and sociology would benefit from having [The Forest for the Trees] in their collection." "DOCUMENTARY MUST-SEE...Agree or disagree with Earth First and its tactics, all people need to be wary about how - and with what evidence - citizens are fingered by the government for prosecution. Ultimately, the film is a vindication for those who harbor ideas and methodologies looked on with suspicion by the government." "[The Forest for the Trees] tells a rare, emotional story...POWERFUL documentary...This emotionally charged film isn't a run-of-the-mill propaganda film."